ROKH is another in the survival genre to head to space, this time the destination is Mars. 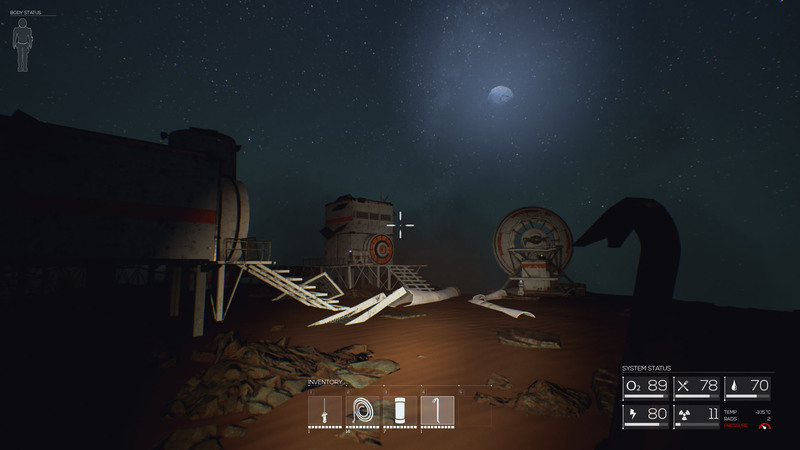 You must work together (or alone) to overcome the threats of Mars and survive on an alien planet as you gather resources from the harsh landscapes and build a base to weather the storms. It’s the ultimate Matt Damon simulator – on paper. There are so many games like this out at the moment that it’s hard to stand out, each one needs to find something unique about it that will make players want to jump in and spend their money on it. ROKH has some interesting takes on the genre, for one the crafting takes on a more modular approach allowing tools, weapons and buildings to be customisable. Some items can be attached to buildings to carry out automated tasks. The problem is, is it all feels very convoluted and to be honest, a little confusing. 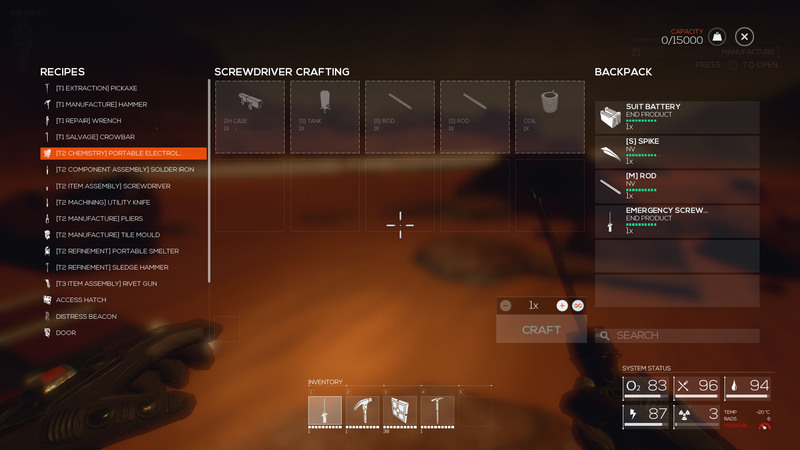 You start with a screwdriver, this lets you craft a few other tools, these tools then let you craft other items, so to start you’re crafting items for the sake of being able to to craft other items. One such tool is the hammer, this lets you start building a base. You’ll need an unreasonable amount of materials to even start making a base that resembles something big enough to actually work in. For one of my first attempts I used roughly 60 wall pieces and that was about enough to make a floor and two walls – so nothing even close to an actual base… But that wasn’t the end of my problems with creating my first base. I tried to build a door, which you can use the hammer to do. But to build a door you need hinges, which – from what I could see, couldn’t be created with the hammer, in fact I couldn’t find any tools that let me create hinges. Maybe I was just being a bit dumb and didn’t notice it, but surely something as simple as making doors should be relatively easy to do? I know that grinding for materials is usually at the centre of survival crafting games but in ROKH it feels like it’s even more of a grind than usual, and this is because the pieces for building walls – whilst still costing a fair amount of resources, are less than half the size of what you might expect to typically see for a wall in a survival game, in fact, I’d say it was 1/9th the size, meaning you’d need 9 wall pieces to build a ‘normal’ wall. Lots of the items you can craft needed pieces that I had no idea how to make or where to find them and for me that was a fundamental problem. They weren’t even advanced things, it was basic items. 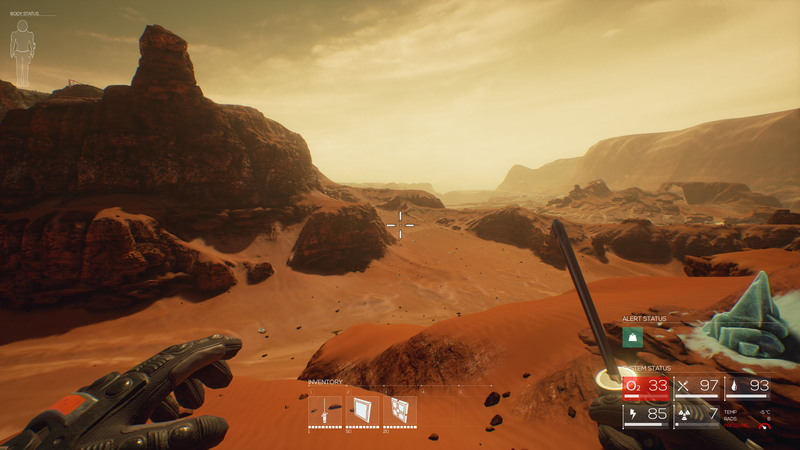 Exploring the surface of Mars is another of the unique features of the game and it does look pretty great whilst you’re doing this. Wondering around large flats of red rock, mountains, deep valleys and abandoned outposts is interesting. There is also the threat of random weather happening and I have to say that the first time a meteor showing rained in on me I was impressed. Firstly it scared the crap out of me as I didn’t know they were in the game, secondly it looked really cool and for a moment I actually feared that I might be pummeled by these fiery rocks raining from the skies. But, with every positive there seems to be a negative. At one point a dust storm rolled in and engulfed me. It didn’t seem to have any impact on me i.e. I wasn’t losing health or getting damaged, but I could barely move – presumably an effect of the strong winds, and this meant I just had to wait out the storm which was quite frankly boring. There was no threat of danger about it I just stood still and waited for it to go away. This would’ve been fine if it only lasted a minute or so, but it went on for a solid five minutes. It just wasn’t a fun thing to experience. One thing I will say that is that one my first time of playing the game was buggy, almost to the point of not being able to play. I left it for a week or so and waited for some patches and it now seems a lot more stable both in terms of the servers and in game bugs. It’s good to see that progress is being made on that front! Currently any kind of PVP isn’t in the game, so you’re pretty free to do what you want without having to worry about some dude wrecking all your hard work. But it is something that should be coming at a later date, although nothing specific has been stated. I don’t specifically think all survival games need PVP, but in ROKH, without it, it feels like there is no threat what so ever which kind of makes the whole experience a little dull or pointless. On paper ROKH sounds great and it has a few things that make it interesting, it just feels like a lot of the game isn’t fleshed out enough just yet. There is potential for to be a good game and this is by no means the last time I will play. I will be keeping an eye on updates to see what differences they make. Maybe it should’ve just had a little more time behind closed doors to get more of the ground work done.